While the varnish on the trim of the Esprit is drying I really have to get other work done. That work is the old Kildonan canoe. Step one is to get that broken gunnel repaired. Its difficult to tell if the gunnel stock is Spruce or Fir. It looks like Fir, so that is what I will use. The wood for these gunnels is quarter sawn with the flat sawn side up. The old gunnels are cut with a long taper on either side of the break. 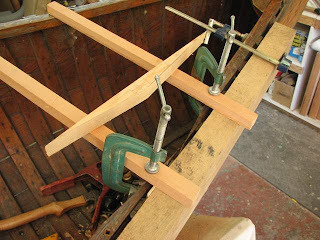 Because its very difficult to fit a new piece to take the exact curve of the gunnel as it sweeps along the canoe, I clamp on a heft piece of hardwood to the outside of the canoe the hold that section straight. 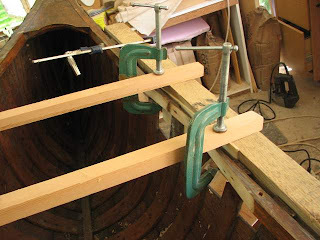 I fit the new piece in such a way that I am fitting a straight piece of wood into a straight gunnel. 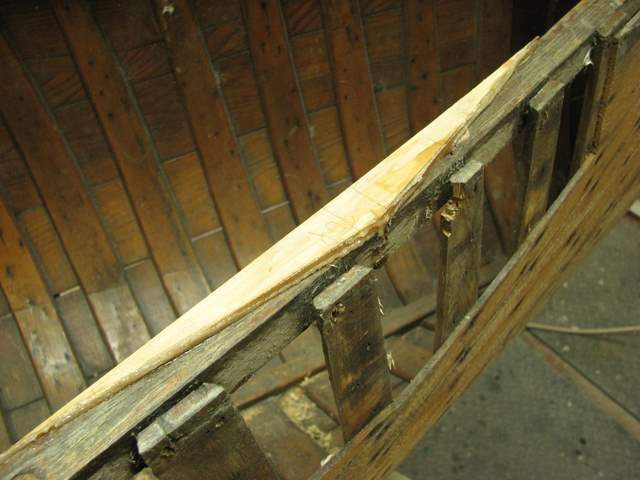 The wood is glued with epoxy to take care of any irregularities in the fit. Once the epoxy cures I remove the clamps and all of the wood takes on its natural curve. 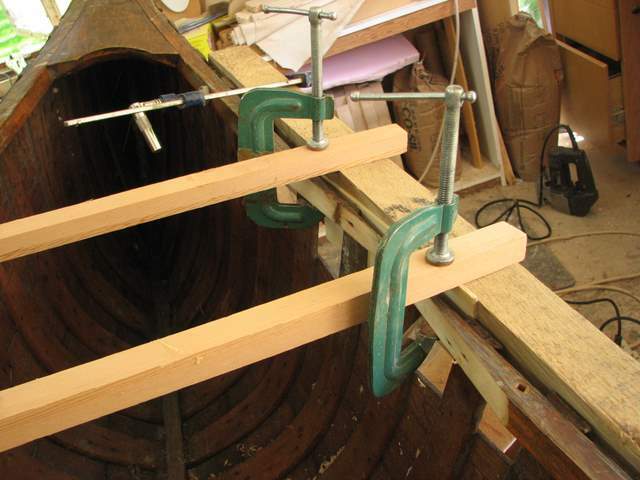 The two pieces of wood going across the canoe are there to hold the two gunnel sections in line. You can see the new piece of gunnel stock waiting to be glued in. New wood glued in and the clamps removed waiting only to be shaped flush.